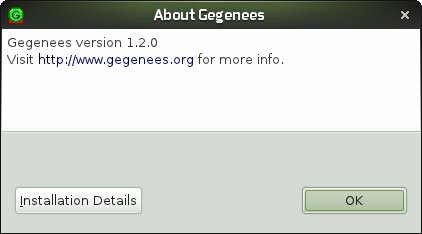 New functionality will lead to version 1.1.0, 1.2.0 .... To see your version, select "About Gegenees" in the Help main menu. There is also a java plugin build version system. This version can be accessed by pressing the "Installation Details" button. This version numbering should be similar to the official version number, but will contain the export date as well. e.g. 2.0.0.201301111048. In this example, the product was exported 2013-01-11 at 10.48. This versoning system is used by the automatic update function. You may want to write down this number if you want to report a bug. 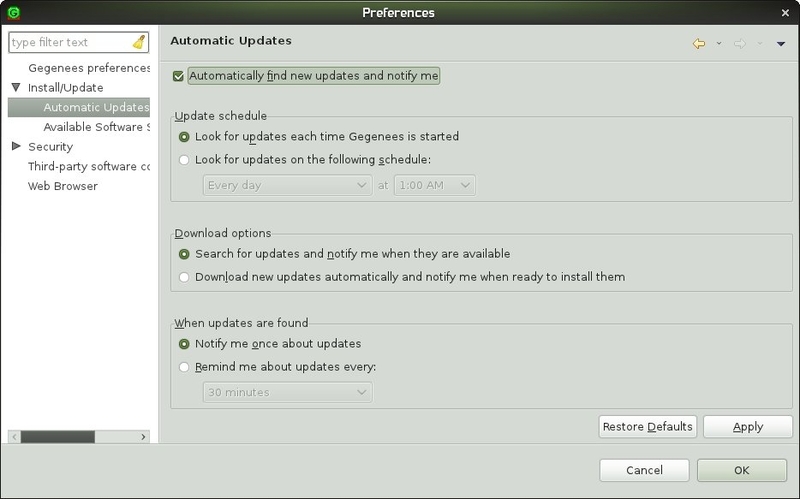 From version 2.0.0 and forward, an automatic update system is included in Gegenees. If you have a older version you should download the latest version and make a fresh installation. You can manually check that you have the latest version by selecting "Check for Updates. In the Help menu there is also an "Install New Software" menu item. With this function you will be able to install sister products to Gegenees. However, today there is no such products avaliable. Note, this menu item only installs "p2-repositories", it does not install third part software that Gegenees uses such as NCBI BLAST. The preferences can be accessed by selecting File->Preferences and expanding the Install/Update menu. it is recomended to have "automaticly find new updates" activated. In preferences the update site is also specified under "Available Software Sites". the default location should be "http://www.gegenees.org/update/repository". If you are part of a beta-testing group, you might be instructed to add another location here.